How old is old? Are you old if you remember going to the print shop the Monday after college graduation to have your resume typeset? Some wiseguy actually suggested that I order two different resumes, one for video production and one for copywriting, to see which one panned out. He didn’t realize I was living off of $9 a week after rent, and was not about to pay any more than the astronomical thirty bucks I was putting out for resumes, cover sheets and envelopes. I wasn’t even sure how I was going to pay for postage. So I chose video. Four days later I was approving the proofs at the hot, stinky print shop, trying not to notice the printer’s baby in a playpen behind the counter, stoned out of its mind on print fumes. Seven to 10 days after that my order was delivered at blistering speed. And so, armed with my resumes and bowel-shaking terror unbridled optimism for the future, I began my meteoric rise to the middle. Thankfully, times have changed. Once we got PC’s we realized we could have as many resumes as we wished. I have tweaked mine relentlessly, emphasizing this and downplaying that for practically every position I have pursued in the past 10 years. The point is, you damn kids have it so easy these days. So, even though there’s only one day left in National Update Your Resume Month you really don’t have an excuse for not keeping your CV current. Besides, all the print shops are gone. And the brain-damaged kids huffing print fumes have all grown up and taken over the mortgage loan industry. I’ve had a long relationship with industrial video. In fact, during the 90’s, that was pretty much it for me. First I worked in a production house that catered to the training, merchandising and presentational needs of corporate biggies like RCA, GE, P&G and others too cool to spell out their names. Then I went “in-house,” and became part of a two-dude production team at a major medical manufacturer. The best thing about being part of a two-dude team was having the opportunity to use all of your skills, and develop new ones. On a typical project I might be the producer, researcher, interviewer, director and editor. The other guy would run the camera on shoot day. And then, on the next project, we would swap. So, it was intense pressure followed by no pressure at all. There were drawbacks, as you would expect. Sure, we could afford to buy an AfterEffects package for the non-linear edit system. But I’m no designer. I can tinker with it, import a logo, fly it in, create a shimmer effect…if you give me a few hours to play with it. I may only ever gain enough skill to make it work…never enough to make it sing, you know? And, sadly, the only thing there wasn’t room for in this skill-development scheme was scriptwriting. The marketing and merchandising folks did an almost-good-enough job at it and, with our limitations, almost was good enough. However, as it became more obvious to me that scriptwriting was where I wanted to specialize, I started moving slowly toward the door. Like any type of job, there were pluses and minuses. For the most part, though, I remember it fondly. Those jobs are tough to come by, but I wouldn’t turn one down if the opportunity arose…as much as I like the independence of freelancing. So, if you’ve got any spare in-house jobs laying around, hep a brotha out! 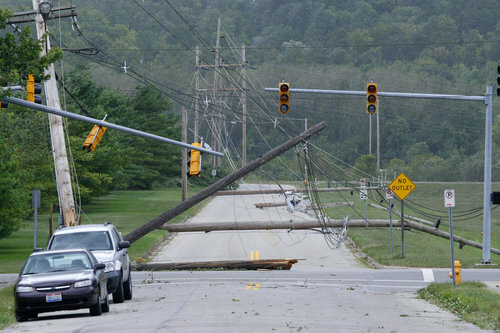 Business is slow because, believe it or not, it’s been five days since the windstorm and 200,000 people in southwest Ohio still don’t have power. Interesting illustration of the the way operations get more fragile the further they stretch out. Just like Hitler at Stalingrad! Sorta. The preceding Hitler joke is an illustration of why humor in business communication is such a rare commodity. It’s tricky, always being concerned that someone, somewhere MIGHT take offense to a genocide joke. Babies! Anyway, somebody at Hallmark cared enough to name September Humor in Business month, so who are YOU to resist? Some wounds don’t heal, and we shouldn’t allow them to. My own humble reflections on 9/11. The cure for the freelance copywriter’s sense of isolation? Inflicting it upon everyone else! Suckers. Another example of the way the freelance copywriter’s mind will play tricks on him. Getting antsy, feeling like I wasn’t doing anything, I decided to make a list. Turns out I was doing plenty, and it was a nice, diversified list of projects. Which then became a neato advertisement for my services. Yay Mikey…Mikey wins!! A talented voiceover artist can make a bad script sound good, and a good script sound great. Yeah, let’s do the second one. Some copywriting specialties you pursue, some just happen. And sometimes you find that special specialty, and you realize you should have been pursuing it all along. It’s the romantic hit of the summer! Remember how I said I would give the art and science of corporate newsletters a rest? Well, this was the post where I said that, so it doesn’t count. I’ve posted a lot of pixels on the topic of long-distance copywriting relationships, and how teh intarwebs have changed our perception of market reach. A phone conference, some online research, a compressed .zip file of your collateral materials, and we’re good to go. It seems there is little reason for us to be in the same room, city or state anymore. At times, however, it would be nice. This past Monday, I was getting pretty antsy. My IN box was too quiet. I had copy deadlines brewing in Cincinnati, Dayton and southeast Indiana, and I was getting nothing. The guys at the places with the things were all silent. One writing gig in particular was the classic hair-on-fire, cancel-everything emergency…and I had nothing. Apparently, the remnants of Hurricane Ike traveled up the Mississippi Valley and pounded the crap out of the OH-KY-IN region. Like, eight solid hours of sustained 75mph winds. Everyone I know there has trees down, roof damage, windows out, no electricity, no internet. Many schools and businesses are closed, gas shortages, and a quarter-million people without power until next weekend. Worst of all–my blog hits are down by half!!!! Anyway, I’d like to send a hearty “WTF?” to our 24-hour, information-overload, flood-the-zone, saturation-coverage cable news providers for telling me absolutely nothing about any of this. And to my friends, family and clients in the great Midwest, thank the Lord that everyone is OK. I wish you all a speedy recovery, free of insurance hassles. And to answer the burning question on every copywriter’s mind: no, the deadlines haven’t moved a bit! I just glanced at my official NBC “The Office” calendar and learned that September is Humor in Business Month. Intrigued, I did my usual exhaustive research (first three Google hits) and found absolutely no background information on this fact. Three other bloggers asking “did you know September is Humor in Business Month?” doesn’t count. So, I guess HIBM (no, I’m not going to keep typing it) is open to interpretation, not unlike humor itself. This is why humor in copywriting is used so sparingly in corporate web, print or video…everywhere outside of advertising. Frankly, I think it should be used MORE sparingly IN advertising, with that weird Seinfeld Windows commercial being prime evidence. I grew up on George Carlin, Richard Pryor, Steve Martin, early SNL, SCTV, MAD Magazine and National Lampoon. I was the weird kid with no friends writing monologues and sketches, performing them into my tape recorder for absolutely no one to hear. I always knew that copywriting was in my future. Naturally, I pursued a career path where I get to express that talent almost never. Business copywriting is often pretty straightforward. This is a business where the new, 20-percent-more-absorbent paper towel is treated like the cure for cancer… so lose the laughs, funnyman! Despite this, I have had more than my share of fun, funny projects. In the course of getting to know people, clients, future clients, etc., my offbeat sensibility peeks out. Eventually, every client needs a funny script…usually something internal like a merchandising, promotional or motivational video script. And I usually get the call. Check out some samples on my Video page. Humor in business communication has its place. It’s a rarity, but that’s not a bad thing. Not being able to automatically utilize my strong suit has forced me to develop my more serious side. When I do get to use humor, it’s refreshing. So, if you get the opportunity, try a little levity in your corporate communications. But you’d better get busy…Humor in Business Month is half over! I spent the morning of 9/11 on the loading dock of the medical supply company where I worked at the time. All regular business had ceased. Trailers packed with that week’s shipments were unloaded and refilled with stretchers, gurneys, IV accessories…anything from our stock that might be of use in an emergency room. By the end of the morning a convoy had blasted off for Roosevelt Hospital in Manhattan. In the end, none of it was needed. As we now know, there weren’t thousands and thousands of injured to attend to. You either made it out or you didn’t. There is so much to recall about that day, and the days after. And a lot of nostalgia about the way things used to be…most of it misplaced. I’m convinced now that the time before seems so idyllic because we simply weren’t paying attention. I am thankful that, seven years on, it hasn’t happened again. I’m thankful for the people, from the president to the soldiers to the lowest-paid airport security people, who have made that possible. And I am thankful for the insight, wisdom and comfort God gave me in those following weeks. I came to a lot of conclusions about life…what and where I wanted to be, and with whom. It took time to make all of that happen, and I had to break a lot of eggs. But I made it. So, this my unbidden advice for 9/11/08: take a moment to say a prayer for the families. Then take the rest of the day to appreciate what you have, and the One who made it possible.